The story of the Connecticut State Grange is really the story of two State Granges. The first state Grange in Connecticut was organized at a meeting held at the Old Taylor Opera House in Danbury on April 15 and 16, 1875. 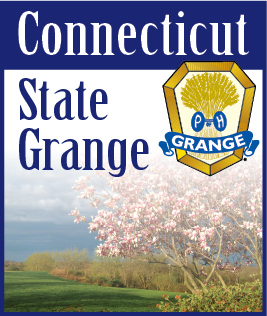 Connecticut became the 33rd State Grange organized under the National Grange of the Order of Patrons of Husbandry with twenty (20) Subordinate (local) Granges comprising the fabric of this fledgling organization. The first 20 Granges included: Stafford No. 1, Windsor No. 2, Lanesville (New Milford) No. 3, Hawleyville (Newtown) No. 4, Granby No. 5, Danbury No. 6, Roxbury No. 7, Sherman (New Milford) No. 8, Hartland No. 9, West Suffield No. 10, Washington No. 11, E. Granby No. 12, Tunxis (Bloomfield) No. 13, Bloomfield No. 14, Redding No. 15, Colebrook No. 16, Kent No. 17, Simsbury No. 18, Housatonic No. 19 and Hope (Torrington) No. 20. Records of the first State Grange are incomplete but it is known that four or five meetings were held, including both special and regular meetings. Lida Ives' book "The Grange in Connecticut" states the following reasons for the demise of the first state Grange, "Misunderstanding and poorly defined rules and regulations led to disputes between sections of the State; improper instruction and understanding of the ritual; lack of proper coordination in having a defined buying and selling agreement between merchants and others; low dues and little money in the Treasury were factors that all contributed to the final failure of this group to operate as a State Grange." Due to these conditions, Grange after Grange dropped from the State Grange's rolls until only two remained. Hope No. 20 of Torrington and Tunxis No. 13 of Bloomfield. Some minor disagreement still exists between the two Granges today regarding which Grange is truly the oldest. Hope Grange continued to meet during the time between the first and second State Granges and paid their dues either directly to the National Grange or through the Massachusetts State Grange, as directed. Tunxis, however, has the oldest Charter, never giving it up even during a four year time period when Tunxis did not meet. Regardless, these two Granges became the important nucleus of the new State Grange. The second attempt at organizing a State Grange in Connecticut met with much more success when representatives from 16 Subordinate Granges met in convention at the Academy Building in South Glastonbury, CT on June 24, 1885. Several Granges organized during the first State Grange were still represented along with many new Granges. They included: Granby, Tunxis, and Hope of the first State Grange along with Lebanon, Advance, Cheshire, Berlin, Union, Glastonbury, Suffield, South Windsor, Meriden, Wapping, Manchester, North Cornwall and Wallingford. 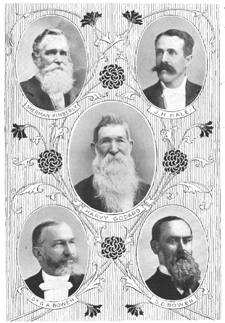 New members joining the State Grange during 1885 and 1886 received what is known today as the Fifth Degree or Pomona (County) Grange degree. Then in 1887, the Connecticut State Grange conferred the first Degree of Flora (Sixth Degree) upon candidates in December of that year. Affordable insurance has always been an important element of Grange programs throughout the nation, even in the earliest years of the Order. Connecticut was no exception. Delegates to the 1885 session authorized the State Grange Executive Committee to "investigate the subject of Grange Fire Insurance and report at the Annual Meeting." Then at the December 1886 Session the following report was made by the Good of the Order Committee, "We would recommend the incorporation of a Patrons Mutual Fire and Life Insurance Company." The resolution was adopted and the insurance company was organized on April 6, 1887 at the United States Hotel in Hartford, under the name "Patrons' Mutual Fire Insurance Company of Connecticut." This company remains in existence today under the name "The Patrons Group." Its headquarters are still located in Glastonbury, CT but the company's reach extends well beyond the state's borders into many northeastern/New England states. The Connecticut State Grange no longer manages the company but both organizations still maintain close ties. Lebanon Grange No. 21 holds the honor of having dedicated the first hall in Connecticut built specifically for the purpose of housing a Grange chapter. In August of 1884, Lebanon Grange authorized the construction of a hall and store for the cost of $1,725.00. The hall was finally ready for dedication on November 12, 1885. Long before the University of Connecticut became a national powerhouse in Men's and Women's Basketball, its predecessor, the Storrs Agricultural School struggled to establish itself as an institution of higher learning in Connecticut. The school came into being as a "Land Grant Colleg" in 1881, just four years before the second Connecticut State Grange was organized. It's prominence in agricultural education in Connecticut wasn't established without struggle. On July 2, 1862, the United States Congress established "An act donating public lands to the several States and Territories which may provide colleges for the benefit of agriculture and the mechanic arts." Along with this act, $7,500 was ordered paid by the Connecticut General Assembly to the president and and fellows of Yale College which operated the college's Sheffield Scientific School. From 1863 through 1886 (24 years) only seven (7) students received agricultural degrees from Yale. These seven degrees cost $25,700 each, an astounding figure even in the 19th century! The Latin and higher mathematics requirements of the program are attributed to the reason why more students did not apply for the Yale/Sheffield agricultural program. Mrs. Ives history of this period reads, "I think that we would all agree that the Connecticut State Grange had a real cause for the agitation they stirred up over this situation. After a long and somewhat bitter fight, you who have followed this history know it was successfully wrested from New Haven and placed through the proper channels of Legislature in the Storrs Agricultural School, but not before injunctions were made and funds held up." "I have come to the conclusion that about which I feel quite strongly and that is the State of Connecticut and the people of Connecticut owe this organization a debt of gratitude that I think will extend for many, many generations. The debt of gratitude stems from positions taken on the number of big questions of considerable import - several in the field of education. At least four contributions will go down in history. (1) Originally, the Land Grant Institution in this State was a private institution. Through the Grange's initiative by legislation this Land Grant Institution is now a public institution - what is now known as the University of Connecticut. (2) In 1922 there was an attempt to liquidate the Land Grant institution. The State Grange stepped in and saved the day. (3) In 1937, through reorganization of government, an attempt was made to remove independence from the Land Grange College and remove the institution's Board of Trustees and place the institution under some other agency. The State Grange and Farm Bureau kept that from taking place. (4) Much more recently there was an attempt to take away from the University its independence and to take away the institution's Board of Trustees again. The State Grange and Farm Bureau teamed up and made their positions known in no uncertain terms. I myself am personally indebted to the State Grange Legislative Committee which, under the very able leadership of A. Ward Spaulding, left no doubt about the position the Grange was taking on this question." From the beginning, Connecticut's members recognized the need for a quality educational system in the state. A resolution from the 1885 session reads "Whereas, The Storrs' Agricultural School, having successfully passed the experimental period of four years, Resolved, that the Order of Patrons of Husbandry, realizing the importance of education for the farm, commend this institution as worthy of our patronage and protection." In 1886, the U.S. Congress appropriated $15,000 annually to each state for the establishment and maintenance of Agricultural Experiment Stations. The Connecticut Agricultural Experiment Station was established in 1887 as the nation's first station and remains today as America's oldest. One of the Station's most important contributions to agriculture was the development of hybrid corn, which revolutionized the farming of corn throughout the country. Many attempts have been made over the years by the State of Connecticut to reduce or eliminate funding to the Station but the Connecticut State Grange has been there each time to help lead the charge in opposition. The Connecticut State Grange has had the honor of hosting the National Grange Convention on four separate occasions. The first session in Connecticut (all held in Hartford) was in November of 1907. A class of 2,490 candidates received the Seventh (National) Degree at that session. Connecticut hosted the 68th Annual Session in November of 1934. Crowds at this session literally stopped traffic in downtown Hartford, especially on the day of the Seventh Degree at Bushnell Memorial Hall across from the State Capitol. Nearly 13,000 Patrons received the Degree of Ceres that day! The third visit of the National Grange was in November of 1972 at the Hartford Hilton Hotel which overlooked scenic Bushnell Park and the State Capitol building. Connecticut hosted the 2008 National Grange Session as part of the Northeast Region of States, with it's home base the Crowne Plaza Hotel in Cromwell. The 7th Degree was again held at the historic Bushnell Memorial Hall in Hartford. For photos and memories from all the National Sessions held in Connecticut, please visit the Connecticut State Grange Virtual Scrapbook. (Top) "ON THEIR WAY TO BUSHNELL MEMORIAL HALL to receive the Seventh Degree after registering at the State Capitol, Saturday morning, Nov. 17." 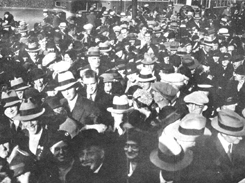 (Bottom) "A VIEW OF THE THRONGS waiting in front of Bushnell Memorial for the 11 o'clock class of the Seventh Degree, given Friday, November 16." Hartford Courant, December 2, 1934. In 1930, the State Grange became aware of the Connecticut Forestry Departmen's efforts to develop"The People's Forest" in Barkhamsted. The park was being developed through the funding of individuals and associations, with more land available. The delegates to the 45th annual session of that year authorized the purchased of a plot of land in the park to be known as "The Grange Plot." The donation was made and the "The Grange Plot" at People's State Forest came into being. People's State Forest was the site of the State Grange's observance of the U.S. bicentennial in 1976, which was attended by then National Master John Scott. "Get Connecticut Out of the Mud"
"In the spring of 1930 when the sun was high and the mud deep, many a Connecticut rural road was impossible to negotiate either by motor or horse drawn vehicle. The man in town could not drive into the rural areas to conduct his business nor could the farmer or rural dweller likewise reach the towns and cities for days sometimes, having to await the action of the elements, either to freeze the mud or dry it up. In either case the result was ruts, holes, and turn outs which were troublesome and costly to meet. It was on one of these days, which was an annual occurance, early in 1930, that I stepped to the phone to ask the then first selectman why he had not fulfilled his promise to me that the worst mud holes on my own road would be filled to make the road at least passable. The reception that I received from the man on the other end of the phone was anything but cordial. He hung up on me three times, the last time his parting words were unprintable. I learned later that he and another official of the town had been out with a horse drawn vehicle inspecting roads and had been stuck for more than two hours. He had just returned when I made my call. You can see now why I can't say what he said before he slammed up the receiver." Shortly after this experience, Brother Tolles sent letters to Pomona and Subordinate Masters throughout the state requesting a meeting in the Hall of the House of Representatives in Hartford to address this issue. Unfortunately, the State Master didn't have the blessing of the State Executive Committee, "because I kicked this thing off all by myself without conferring with my Executive Committee, when we did meet their faces were long enough to eat oats out of a churn. However, when they saw the popularity of it all, they being good sports, I guess forgave me and pitched in and helped through to the end like good soldiers. By this time, the newspapers had begun to spread the news of our doings, some favorable and some rather dubious, and others just hostile." Following the meeting at the Capitol, the Connecticut Rural Roads Improvement Association Incorporated was formed with State Master Tolles as its president. As a result, the State Legislature passed the "Town Aid Bill" allocating $3,000,000 to be allotted from the Highway Fund for division equally among the 169 Connecticut towns for improvement of roads. The allottment was increased over the years following the initial act of the Legislature, with the fund being distributed to towns based on need rather than in 169 equal portions. 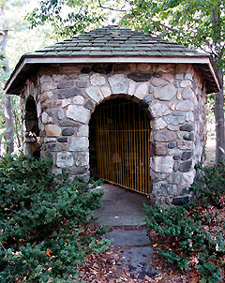 The "Little Stone House" dedicated in 1937, located on Northeagleville Road, across from Swan Lake. In 1934, Brother Albert Marsh, of Burritt Grange in New Britain went before the State Executive Committee to present his idea for a tribute to agriculture. For its construction, he volunteered his own collection of stones from each of the 169 towns in Connecticut and the, then, 48 states in the Union. The idea was greeted with enthusiasm and the completed memorial was dedicated at the May 16, 1937 Grange Sunday held on the campus of the State College (now the University of Connecticut campus) in Storrs and attended by National Master Louis J. Taber and Dr. A. N. Jorgensen, President of the College. For many years after its inception, Grange leaders in New England hoped to have a centrally located Grange building in the region for use as a meeting place for members and for New England Grange activities. National High Priest of Demeter Charles Gardner shared this desire and spear-headed the drive to construct the New England Grange Building on the grounds of the Eastern States Exposition. The building is located along the Avenue of the States in the heart of the Exposition grounds (often referred to today as the "Big E") located in West Springfield, Massachusetts. The Avenue of the States features replicas of current or colonial era Statehouses from each of the six New England states. The Grange is the only organization featured on the avenue this way. Lida Ives' history describes the building: "It is truly a Grange Hall, with a spacious basement where meals would be served in any real Grange Hall, but is here used for Grange Exhibits during the Exposition. On the Ground Floor, one enters a spacious auditorium which is reported to seat about 400, with the usual stage. A beautiful fireplace graces one side of this room which is more often used as a living (reception) room for the building. The Second Floor is encircled on three sides by a balcony, two sides of which are lined with the individual New England State Rooms. The Connecticut Room is located to the left as you mount the easy stairs leading to this balcony. It is a beautiful room, panelled with natural woods and octagon in shape. On the floor rests a green rug with the typical sheaf of wheat upon it. Natural Maple Windsor chairs, settee and two small tables comprise the furniture in it. Two spacious cupboards or full length closets fill in two of the corners, while another holds a door which opens out upon the balcony over the front entrance." The Connecticut State Grange continues to contribute to the maintenance of this building each year along with the other five New England states with each state's portion being determined by membership in each state. Connecticut's members faithfully volunteer time each September to ensure that visitors to the Fair will find Connecticut Grange members ready to greet them in the Connecticut Room. The Building was dedicated on September 21, 1938. This day will live in infamy as the day the "Great Hurricane of 1938" ravaged New England and the east coast. The storm struck the Eastern States Exposition grounds shortly after the dedication was completed and the Patrons in attendance had gone home to wait out the storm. Amazingly the new Grange Hall withstood the storm suffering little damage while the storm managed to level the rest of the Fairgrounds... a great testimony to the craftsmanship and fortitude of the organization! As a testament to the Connecticut State Grange's contributions to the University of Connecticut, a hall was dedicated on the campus. It is appropriately named "Grange Hall." There was a mounting housing shortage on the Storrs campus in 1940 that was causing a great deal of concern to President Jorgensen. Earlier that year, the State Grange had established a scholarship at UConn which drew donations from each of the Pomona and Subordinate Granges in the state. During a coversation with State Master Sherman Ives, President Jorgensen asked how many members there were in Connecticut. He was told that there were 20,000. He then proposed the idea of each Grange member in the state donating $1 each with the college matching the 20,000 one dollar donations for the construction of a residence hall on campus to be called "Grange Hall." During 1943, the support for the war effort was varied and substantial. The greatest achievement during this time was the raising of $487,000 worth of War Bonds during the Third War Loan Drive. In recognition of this achievement, the War Department named one of its flying fortresses, "Connecticut Granger." Above is a photo of the "Connecticut Granger" Flying Fortress named for members of the Connecticut State Grange for their efforts in selling war bonds during World War II in 1943. The photo appeared on the cover of the first issue of the Connecticut Granger newspaper in 1959. One of the first of its kind in the nation, Camp Maud Isbell Berger was established by the Connecticut State Grange in 1956 as a summer camp for Connecticut's large Junior Grange membership. Over the years the doors have been opened to all children ages 7-14. Located on scenic Park Pond in Winchester Center, CT, Camp Berger offers an exceptional camping experience at prices that make it one of the best summer camping values in the state. Above is a photo of the crowd at the Dedication Ceremony of Camp Berger, 1956. In 1967, the Connecticut State Grange established its own statewide fair on the Durham Fairgrounds in Durham, CT. The event had been held every year since it's inception, growing in size and popularity with each edition, culminating with its 39th year. 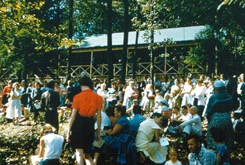 The Connecticut Agricultural Fair in recent years was held on the fairgrounds in Goshen, Connecticut and was made possible entirely by the never-ending support of over 300 volunteers and every Grange in the state. Agriculture took center stage with some of the state's finest agricultural exhibits and contests along with plenty of national and local entertainment along with fine food and much more to round out the Fair's offerings. The fair was always held on the last full weekend of July. For photos and memories from Connecticut Agricultural Fair, please visit the Connecticut State Grange Virtual Scrapbook. Inside the Dairy Barn at the Connecticut Agricultural Fair. State budget cuts have been an annual tradition in Connecticut. Among the many targets has been the state Department of Agriculture. One attempt in the 1990's was thwarted by the State Grange and other organizations by an aggressive letter writing campaign and lobbying program by the State Grange Legislative Committee. Severe budget shortfalls in 2003 caused the department to be put on the block yet again. Plans currently call for this department to be combined with the State's Department of Consumer Protection. The Connecticut State Grange is working to preserve the department but realizes that it may not be possible in the end. In that event, the Grange is also working to ensure that the new combined department would still provide the services and support once provided by a fully-funded, stand alone Department of Agriculture. Connecticut has lost over 21% of its farmland since 1984 at a rate of nearly 9,000 acres per year. This alarming trend resulted in the establishment of the Working Lands Alliance and its non-profit organization, the Connecticut Farmland Trust. As a member of these organizations, the Connecticut State Grange is working to help raise funds for the CFT to fulfill its mission to purchase development rights to farmland across the state, preserving the beauty of Connecticut's open spaces for generations to come. The greatest misconception about today's Grange is that it's for farmers. While agriculture is still at the heart of the organization, it's not a "bunch of farmers" anymore. Today's Grange works to improve conditions for rural and urban Americans. The centerpiece of Grange activity today is community service. In Connecticut, each Grange determines what is needed in their individual communities and try to fill the void. The projects are many and vaired. They include: the Candy Cane Express holiday train ride for children with cancer, purchasing dictionaries for school children, preserving a Post Office and its zip code for a small community, collecting food for shelters, distributing bike helmets to children across the state, creating Memory Books and collecting needed items for the State Grange's Foster Children's project, purchasing defibrillators for local police/fire departments, and so much more! The Connecticut State Grange Legislative Committee is extremely active and very well-known in the halls of the State Capitol in Hartford. Delegates from each Grange meet in session each October to deliberate over resolutions which become part of the State Grange Legislative Policy which the Director and his committee promote to legislators at each session of the General Assembly, often testifying with Grange positions on the issues in hand. This brief history of the Grange in Connecticut only touches upon a few of the many great accomplishments of this organization. The Grange is constantly evolving and making new contributions to the State of Connecticut and America through the efforts of its members. The greatest achievements in the history of this State Grange very well may be the achievements yet to come!